We'll be playing just a couple performances this year. If you're looking for music that's light & breezy, check out TheHippieProject.com. Some of us are members. James Taylor, CSN, America, Cream, Peter, Paul & Mary, CCR, Joni Mitchell, Monkees, and much more. 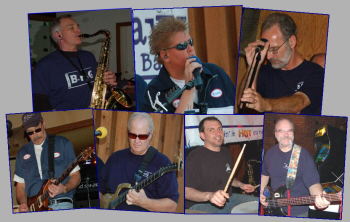 BnG delivers a high-energy performance with a wide variety of songs of many genres. We focus on providing a show that is FUN and interactive for the crowd. For BnG, the performance is all about the crowd! Whether you're young, seasoned, seeing us for the first time, or hookin' up with good friends, BnG has music for everyone. have a great time! Give BnG a call! Join our BnG GROUP on Facebook! ..it's not just for breakfast anymore! Get a free BnG T-Shirt!